One of the things I wanted to explore with you but did not get around to, was a year-long adult Christian formation program, which all members of the church could engage in. I believe, all churches need more than the Sunday worship service to grow in our faith. There are many faith conversations we can have as a community to appreciate and embrace our pilgrimage together. As the world changes around us, we are called to visit and revisit our faith in the light of all the moving parts. Jesus questioned and challenged age-old traditional understandings of what it means to be faithful to God. The story of Jacob wrestling with God is more than just his story; it is a good metaphor of our own faith struggles to understand where and how God might be calling us at this particular time, in this particular place, and in this particular circumstance. I have asked the Rev. Norman Macleod, who will be your Interim Priest-in-charge upon my leaving, to offer the community a Lenten study that will inform our faith as we face multiple issues beyond our church walls. I hope you will carve out time to be a part of the Lenten study, not just to learn from Norman but also to see it as an opportunity to grow together as a community. Below you will find an overview of the study he is going to offer. More detailed descriptions will follow in the weeks to come before the study begins. It will be a five-week offering starting the Wednesday after Ash Wednesday and ending the week before Holy Week. We need five families or couples or ministry groups to offer a simple soup supper for those evenings. If you would like to be one of the five families, couples or ministry groups to host the soup supper on one of the Wednesdays, please let Betsy Stevenson know via email (Calvchurch@aol.com). A sign-up sheet will hopefully help in knowing how many people you can prepare the soup supper for. Thank you in advance for your participation. We look forward to seeing you here at Calvary on Sunday! Abundant blessings & best wishes. … the gift of joy and wonder in all your works. Amen. In the language of the Bible, the word “repent” means to “turn.” Calvary’s Lenten study this year will turn toward beauty, awe and wonder. We see and know God’s power in Creation, in the waters, stones, skies and living creatures surrounding us. These passing glories proclaim God’s eternal presence. When we contemplate them, God feeds our souls. God strengthens us for our Christian call to heal and restore our Earth and one another. Yet, our knowing the wonders of Earth suffers in the midst of 21st century stress. These informative hours dedicated to remembering, seeing and celebrating “all things bright and beautiful” are a right and proper Lenten work of repentance. The study will begin Wednesday, March 16 at 6 p.m. in the Parish Hall, beginning with a simple Lenten meal of vegetarian soup and bread. The Rev. Norman MacLeod will then lead participants in exploration, discussion, scripture readings, prayer, praise and even, God willing, some singing. We will explore and celebrate the glory of God as we see and know it in Stonington and beyond. Each session will close before 8 p.m. The series will continue the following Wednesdays in Lent through April 10, beginning at 6 p.m. with the simple meal. Prayers, scripture passages and hymns from the recent book, God’s Good Earth, will frame the discussions and Norman’s brief meditations. Anne and Jeffery Rowthorn compiled and edited God’s Good Earth, published this year. Anne is a noted author and retreat leader. Jeffery is a hymn writer, liturgical scholar, and a retired Bishop Suffragan of the Episcopal Church in Connecticut. Last Sunday, after our 10 a.m. worship, I drove to Dorchester, MA to attend Candlemas Evensong & Benediction at the Parish of All Saints, Ashmont. My dear friend and colleague Andrew Sheranian is organist & choirmaster there. All Saints is a high church, Anglo-Catholic parish with a wonderful choir of men and boys, so Candlemas there is quite the major production. The sheer volume of incense alone is beyond belief. The choir, clergy, and congregation are all thoroughly incensed during the Magnificat and then again at the great candlelight procession. During all this, of course, the rafters shake with glorious choral and organ music of the highest order. Such splendid, ritual-filled celebrations have a way of transporting one to another place. Nowhere outside of the church do we receive such a powerful sensory experience; sights, sounds, and smells unlike any other. That, I suppose, is exactly the point; ritual has the power to bring one closer to the transcendent. Every now and then I need a good dose of high church to remind me of the richness and breadth of the Anglican/Episcopal tradition; from low church to high. 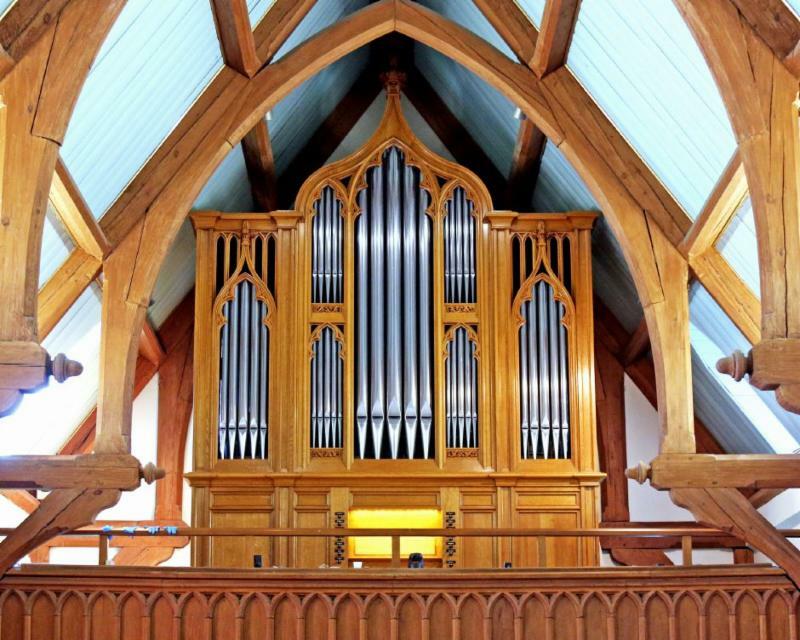 My first experience playing the organ in church was in the Episcopal Church, as was my first real job as organist during high school. In Montreal, during my years at McGill University, I spent quite a bit of time in another Anglo-Catholic parish where most of the organ teaching took place. There, like All Saints, Ashmont, ritual reigned supreme. Never will I forget their Holy Saturday Great Vigil of Easter in which twin thurifers spun their thuribles high above their heads, like the whirling blades of a helicopter, during that stirring moment when the angel announces that Christ is risen, the lights shine again, and the organ roars with a great Alleluia, not heard since Lent began; simply breathtaking! Do you need such a fix every now and then? Let me know. I can help you with that. Our next gathering will be on Sunday, February 10 @ 11:45..So if you are available and would like to join the gathering, please do. No reservations are needed.We enjoy good food, fellowship and conversation. His Girl Friday: This is one just for yuks; to chase away the mid-winter blues. Hildy Johnson (Rosalind Russell) is about to get hitched to dull insurance agent Bruce Baldwin (Ralph Bellamy) -- that's if her ex-husband, ruthless newspaper publisher Walter Burns (Cary Grant), doesn't succeed in winning her back. he Food Pantry has asked if donors would run a monthly cereal drive. So, Calvary Church has designated February Cereal month. Cereal is expensive but also an important food need for busy families. Cheerios, Raisin Bran and honey oat cereals are examples of options which work well for all ages. Their Daily Living closet is always in need of dish soap and laundry detergent. Items can be brought to the PNC. They are always available to stop by and pick up food as well.